Chefs Jon Shook and Vinny Dotolo opened Animal in 2008. They struck gold with pig fat and innards. 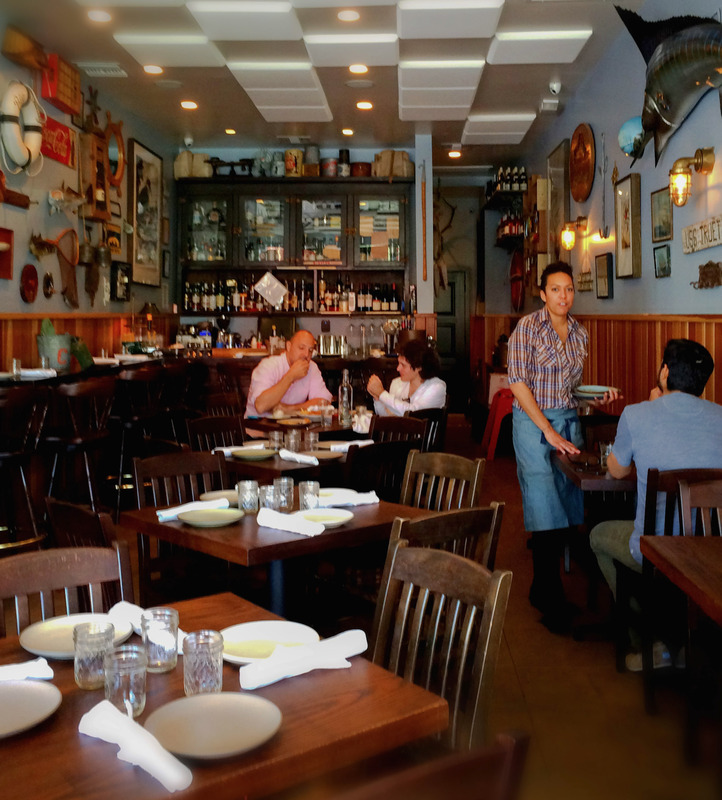 They followed up with the slightly more ambitious, seafood-oriented Son of a Gun in 2011. Then last year they made the leap from chefs to rather-rockstar-ish culinary enablers. They’re the behind-the-scenes partners at celebrity chef Ludo Lefebvre’s wildly successful Trois Mec, and the imminent Petit Trois. And now they’ve got another project in the works – a wine shop and eventually a cafe – in the old Damiano Pizza space just up the street from Animal. I figured this was as good of a time as any to check with Son of a Gun to see how everything is going there. The kitchen welcomed a new chef de cuisine in June, Dave Sykes, a protégé who rose through the ranks at Animal before being anointed to run Son of a Gun. And remember that big, annoying communal table that took up nearly half the restaurant? They recently got rid of it. It’s much easier to get a reservation now, or at least that’s the case during the week and at lunch. The restaurant feels refreshingly more grown-up with proper tables. And the cooking? I think it’s better than ever. Sykes clearly has a knack for raw fish. 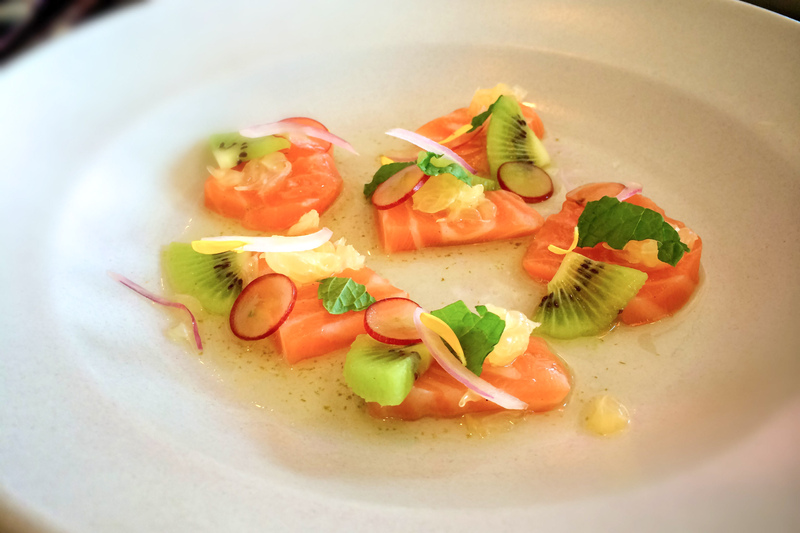 The Scottish salmon crudo is incredible. The sushi-grade fish is lightly dusted with some sort of habanero-laced jerk spice and decorated with kiwi and mint. I can’t think of a better way to start a meal on a hot summer day than this. 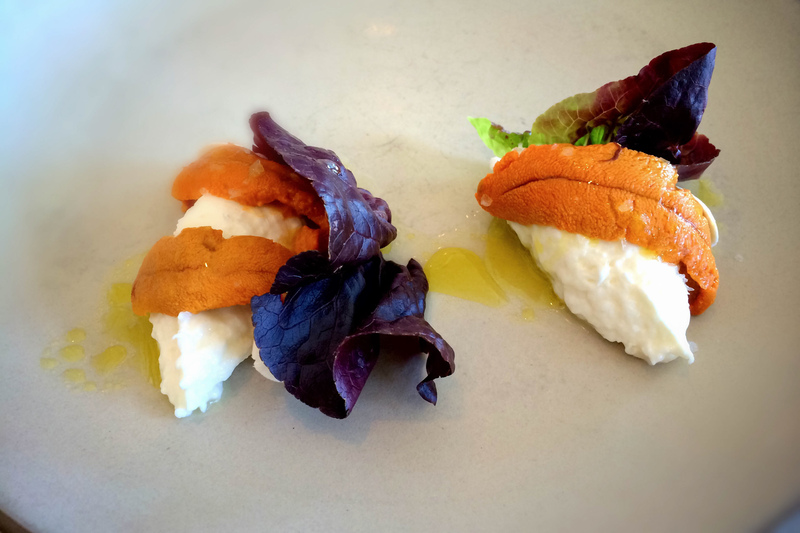 Except for maybe the burrata with uni. Overall, the menu doesn’t appear to have changed much since the early days. Everything simply feels more refined, more finessed. The world’s tiniest lobster roll is still offered here, and it’s a powerful little bite – plan on ordering one of these for every person at the table. 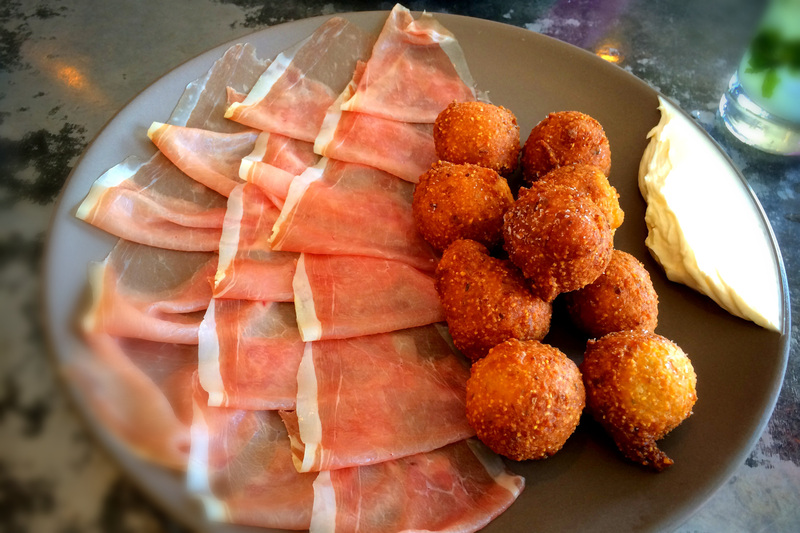 And I know this is a fish place, but one of my favorite dishes here is still the hush puppies served with shaved American ham from Kentucky, which holds its own against the best prosciutto from Italy or Jamon Iberico from Spain. They serve it with whipped honey butter. Grab a piece of ham, wrap it around a hush puppy, and drag it through the butter. Dang, that’s good stuff. When: Dinner nightly; lunch, Mondays-Fridays. UPDATE: An earlier version of this story stated that the new chef as of March was Jeffrey Yoguchi. Yoguchi indeed took over the kitchen in March, but then in June, Dave Sykes took over. This article originally appeared in the Los Angeles Register. To view more of my work for the Register, check out the archives. For more dining and travel inspiration, I invite you to follow me and join the conversation on Facebook, Instagram and Twitter.